Also known as buffalo gnats because of their humpbacked appearance, black flies(Simuliidae) are small (up to one-eighth of an inch long) dark flies that typically appear in late spring and early summer when they swarm and bite birds and mammals, including domestic animals and people. Males and females feed on nectar. 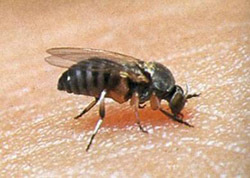 Male black flies do not bite, but females of most species must feed on blood to produce eggs. Some prefer to bite one type of host. Some species bite people in certain locales, but do not bite in other parts of the species’ range. Like horse and deer flies, black flies bite using their mouthparts like scissors to cut into skin and lap up the blood. This results in painful bites that can produce bleeding, itching, inflammation and swelling, as well as allergic reactions that can be life-threatening. The flies may enter noses, ears and mouths, causing further discomfort. Domestic animals, especially poultry and exotic birds, can be killed by black fly attacks. While black flies are not known to transmit disease to humans in the United States, human deaths (presumably from allergic reactions) have been reported. Black flies are aquatic insects that typically prefer clean, fast-running water. Females lay hundreds of triangular eggs in or near the water. 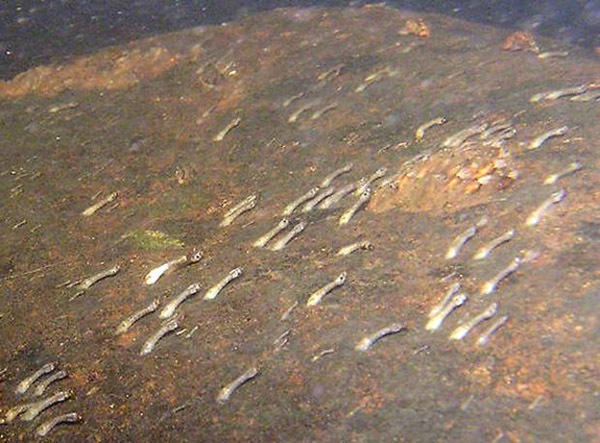 Some crawl beneath the surface to deposit eggs on submerged objects such as rocks. The worm-like larvae hatching from these eggs are typically less than half an inch long and shaped like an hourglass. A newly hatched black fly larva produces sticky silk to anchor itself to underwater objects. It then drifts downstream on a strand of silk until it locates a suitable object. Using more silk and hooks on its posterior end, the larva attaches to the object, usually a stone less than 10 feet below the water’s surface. Once anchored, the larva faces upstream and uses its sticky, fan-like mouthparts to feed on bacteria. The larva will grow and develop into a pupa. An adult black fly emerges from the pupal cocoon and reaches the water’s surface by crawling up an object or by floating to the surface in a bubble of air. Black flies are usually found around fast running water, such as river rapids and waterfalls, probably because these allow larvae to filter a greater volume of water to consume more food. Adults will fly 10 miles or more in search of blood, though they are most commonly encountered close to the water sources where they develop. The flies are attracted to the carbon dioxide exhaled by people and animals, and also to perspiration, fragrances and dark, moving objects. They are most active just after sunrise and before sunset on calm days. Avoiding infested areas at these times is the best means of preventing bites. You can help prevent bites outdoors by wearing long-sleeved shirts, long pants, and a hat with netting designed to keep flies off the head and neck. Some have suggested wearing construction-type hard hats, smeared with oil or petroleum jelly, to reduce biting and incapacitate flies that land on the hat. In patio settings and open structures where livestock are kept, large fans can be operated to help deter the flies. If netting is used to screen off an area, it must be of very fine mesh because black flies can penetrate most window screens. Black flies are difficult to repel. Suggested “home remedy” repellents, such as vanilla extract, have not been scientifically proven effective. DEET-containing repellents that deter mosquitoes are much less effective at repelling black flies and have even been reported to attract the flies. Permethrin-containing repellents labeled for application only to clothing offer some protection. The application of pesticides for black fly control often meets with limited success. In some situations, liquid residual pesticides may be effective when applied to surfaces where flies land. Fogging in the form of ultra-low volume (ULV) treatments like those used for mosquito control can be useful in some circumstances, but provide only temporary relief. 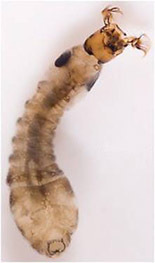 Larvicides (pesticides that kill insect larvae) such as those containing Bacillus thuringiensis israelensis (Bti) have been used against black fly larvae. However, successful larvicide application typically requires technical expertise to locate black fly larvae, select an appropriate larvicide, and properly time the applications. Also, the label directions of most larvicide products intended for use against mosquito larvae do not allow application for control of black fly larvae. Additionally, use of such products may require applicators to be certified by the Illinois Department of Agriculture, and pesticide application to drinking water sources such as rivers and creeks is regulated by the United States Environmental Protection Agency, and in many cases is prohibited. Photographs and illustrations courtesy of United States Environmental Protection Agency, and Jason Neuswanger, Troutnut.com.